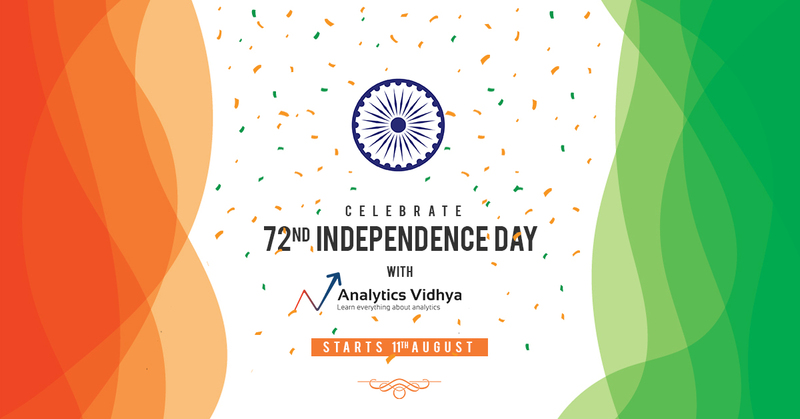 Independence Day Bonanza with Analytics Vidhya's Offers and Launches! Home Analytics Vidhya Independence Day Bonanza with Analytics Vidhya’s Offers and Launches! India is celebrating its 72nd Independence Day and so are we! It’s day to celebrate our past, enjoy the present and be optimistic about the future. What would be the best way to do this? The best way is to build things for future and enable more and more people to do so. That’s what we will be doing this Independence Day. Let me tell what is in store. Dr. Avik Sarkar is the Head of the Data Science Cell as part of the Indian government’s NITI Aayog initiative. He is involved in the effective use of artificial intelligence, big data and data science techniques for social good in areas of real-time governance, healthcare, agriculture monitoring, education, energy, etc. This exclusive podcast will feature Kunal in conversation with Dr. Avik about the state of the data science field in India, what and how NITI Aayog is using data science to work on various challenges in multiple Indian sectors, among other things. 60% off on all training courses!! We will offer incredible deals on our existing as well as upcoming training courses . It all kicks off on 11th August midnight. Check them out. Whether you want to learn data science, machine learning, computer vision, MS Excel, or want to understand what Artificial Intelligence is from a business leader’s perspective, we are offering each of these courses at flat 60% off. An unmissable offer! Flat Rs. 1,000 off on DataHack Summit 2018 tickets! Analytics Vidhya’s flagship event DataHack Summit 2018 is one of the most anticipated and eagerly awaited machine learning, deep learning artificial intelligence and IoT conferences this year. It will be held on November 22-24 in Bengaluru. To get flat Rs. 1,000 off on DHS 2018 tickets, use the code IDAY1000. How can data science power the agriculture industry? How smart cities projects is evolving, you might think the use data in smart city project? Knowing the diversity, how data can help to define and deploy policies to uplift the social strength? How are we taking help of recent technologies(AI) to improve the healthcare services? Or how about the electricity and water sector? These are just some of the sectors we will be exploring in our Independence Day article (to be published on 14th November). Data science is a powerful tool so why shouldn’t we use it for the betterment of this wonderful nation? We will provide links to resources like open datasets which you can download and contribute back to the community. It’s both an informational piece as well as a call to action. All aboard the ‘Data Science for good’ express! Stay tuned for more details. We will announce this on 14th August. Excited? We are as well. Enjoy Analytics Vidhya’s offerings and once again, a very happy Independence Day to our community! 18 Minutes, $40 – Fast.ai’s Algorithm Beat Google’s Model in a win for Every Data Scientist!